The Mobo Triton Pro has all of the qualities you're looking for in a leisure use bicycle: comfort, a smooth ride, and easy maintenance! The unique steering mechanism of the Triton Pro makes navigation easy and fun. The patented design and adjustable frame makes riding the Triton Pro comfortable for riders of various heights and sizes. There are so many exciting features of the Triton Pro. Just one ride and you're hooked. 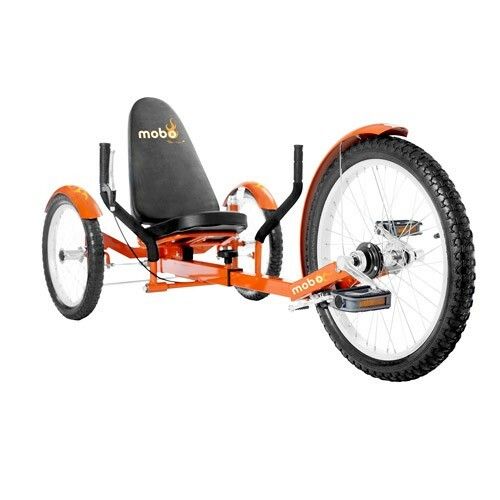 The Mobo Triton Pro has all of the qualities you look for in a leisure bicycle: comfort, a smooth ride, and durability. The Mobo Triton Pro features a dual-joystick steering mechanism that is exhilarating to use and provides a smooth maneuverability. Unlike chain-driven bicycles, the Mobo Triton Pro’s propulsion system requires minimal maintenance because it uses a front free-wheel mechanism connected directly to the pedals. The sturdy front steel frame can be extended or contracted easily, making the Mobo Triton Pro suitable for riders from 4’ to 6’3” and it holds up to 250 lbs. This cruiser maintains a low center of gravity, thus making it especially stable and safe for the whole family. The comfortable recumbent seating position means minimal pressure on your back, wrists, elbows or hands. Perfect for riding at the beach, achieving a brisk work out and for leisure rides. What a great way to stay fit while having fun!